How decisive was the Liberals' victory last night? What do I need to know about Justin Trudeau? What do we call Mr. Trudeau now? When does Mr. Trudeau take office? What will be Mr. Trudeau's first order of business? Who might be in Mr. Trudeau's cabinet? When does Parliament come back? Just how bad was the Conservatives' defeat on Tuesday? Is Stephen Harper stepping down? What is Mr. Harper's legacy for Canada? What's happening to Tom Mulcair? What about the other party leaders? How many Canadians turned out to vote? Did Canadians have any trouble voting? How many women did Canadians elect to Parliament? How did race and income factor into the election results? How did the pollsters fare at predicting the outcome? Who has congratulated Mr. Trudeau so far? How has the international media reacted? That whole election campaign was just a blur. What happened again? What did the parties promise to do? Where did the parties raise their money? How decisive was the Liberals’ victory last night? The man derided by the Conservatives as “just not ready” to govern will now return to his childhood home, 24 Sussex Dr., as the second Trudeau (after his father, Pierre) to take up residence as prime minister. First campaign slogans "Come work with me" "Real change"
Campaign songs None Deadmau5, "The Veldt"
The Globe’s Ian Brown got to know Justin Trudeau and his team on the campaign trail. Read his subscribers-only profile of the new prime minister here. Mr. Trudeau said Tuesday that he plans to appoint his cabinet on Nov. 4. Once that happens, Mr. Trudeau and his cabinet ministers will take their oaths of office at a ceremony with the Governor-General at Rideau Hall in Ottawa. What will be Mr. Trudeau’s first order of business? Mr. Trudeau, who ran on a platform of raising taxes on higher-income Canadians and giving tax cuts to the middle class, said earlier this month that the middle-class tax cuts would be a Liberal government’s first legislation after election day. Who might be in Mr. Trudeau’s cabinet? When picking a cabinet, Mr. Trudeau will have MPs from every region of the country to choose from, including some of the Liberals’ star newcomer candidates in the GTA like former Toronto police chief Bill Blair and ex-general Andrew Leslie. The Globe reported on Tuesday that Mr. Trudeau has tapped ex-bureaucrat Peter Harder to head his transition team. Just how bad was the Conservatives’ defeat on Monday? The bloodletting has already begun within the Conservative ranks as the party asks how things went so wrong. Mr. Harper’s campaign manager, Jenni Byrne, is now out of a job, and sources cited by The Canadian Press’s Jennifer Ditchburn said that she and campaign director Guy Giorno clashed over key elements of the campaign. Yes. The Conservative Party announced Monday night that Mr. Harper’s been instructed by the party to ask for an interim leader to be appointed. Steven Chase: Who could replace Harper? What is Mr. Harper’s legacy for Canada? Here’s The Globe’s John Ibbitson, who recently published a biography of Mr. Harper, on the impact the Conservative government left on Canada and what Canadians won’t miss now that he’s gone. What’s happening to Tom Mulcair? Mr. Mulcair did not step down, despite the NDP’s third-place status and the dramatic loss of the Quebec power base it won in the 2011 “Orange Crush.” Mr. Mulcair kept his own Outremont riding, but other prominent NDPers in Eastern Canada were ousted by the Liberal sweep of the Atlantic provinces. The Bloc’s Gilles Duceppe lost his riding, while Green Party Leader Elizabeth May held on to her Saanich-Gulf Islands seat in British Columbia. Ms. May has offered to work with Mr. Trudeau on the upcoming United Nations climate conference. Elections Canada says 68.5 per cent of eligible voters cast ballots in the 2015 election, the largest turnout in more than 20 years. The last election to have turnout that big was in 1993, which also resulted in a sweeping Liberal win for Jean Chretien. Voters in ridings across the country reported confusion at the ballot box, including mix-ups about what identification they could use. Critics of the Fair Elections Act blamed the controversial bill for tightening voter-ID requirements, making voting more difficult for aboriginal people, students and homeless people. Explainer: What is the Fair Elections Act? Canada elected 88 female MPs to Parliament on Monday, a new record, with women taking 26 per cent of seats, compared with 77 seats in the last election. This year, the five main parties fielded 472 female candidates, one-third of 1,427 candidates in total. This is an increase from 405 in the last election, but 30 new ridings have also been created, and many of the female candidates were running for the Green Party or the Bloc Québécois, with no chance of winning their riding. Among the three main parties, the NDP had the highest proportion of female candidates at 43 per cent, according to calculations by Grace Lore, a researcher with Equal Voice, a non-partisan group advocating for more women in politics. The Liberals had 31 per cent female candidates. The Conservatives had less than 20 per cent. Canadian ranks 50th out of 190 countries for female representation, according to the Inter-Parliamentary Union. Interestingly, the Liberals – who staked their electoral fortunes on middle-class tax cuts and tax hikes for the wealthy – did about the same regardless of voters’ income in any given riding. 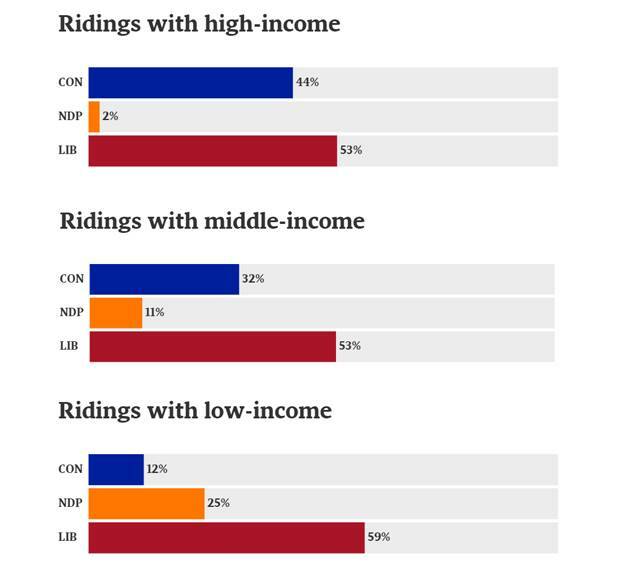 Income did influence whether voters were more likely to support the NDP or Conservatives; high-income ridings had more Tory support, whereas the low-income ridings gave higher returns to the NDP. Erin Anderssen: Who are the middle class, anyway? Polling firms did reasonably well at gauging voters’ support for the Liberals, but didn’t anticipate the full extent of the Liberals’ last-minute surge. The final forecast on Sunday night in The Globe’s predictive election model gave the Liberals an 81-per-cent chance of winning the most seats, but gave an 18-per-cent chance of the Liberals getting a majority. Atlantic Canada: The Liberals completely swept the Maritime provinces and Newfoundland, a region Mr. Harper famously criticized for embracing a “culture of defeat.” Long-serving NDP MPs like Peter Stoffer and Megan Leslie also didn’t survive the Liberal onslaught. Quebec: The province had been a bastion of NDP support after the 2011 election, but on Monday the Liberals – whose legacy in the province had been tainted by the sponsorship scandal – surged ahead as voters looked for a new alternative to the Conservatives. Ontario: Mr. Trudeau managed to cature suburban ridings outside Toronto that had been key to Mr. Harper’s 2011 majority. Conservative ministers Joe Oliver, Chris Alexander and Julian Fantino were ousted, as was the NDP’s Olivia Chow, widow of former NDP leader Jack Layton. Prairies: The Conservatives held on to their stronghold in Western Canada, a region where the Liberal brand (and the Trudeau name specifically) has been tainted in the past by association with Pierre Trudeau’s National Energy Program. 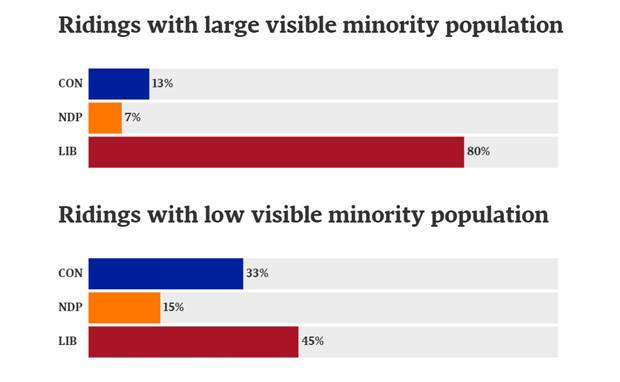 But the Liberals and NDP did make gains in urban ridings, with the Liberals winning two seats each in Edmonton and Calgary – a city they had been shut out of for 47 years. B.C. : The creation of new B.C. ridings in this election made it a key battleground, though broadcasters had called a Liberal victory even before polls had closed in the province. The Liberals got more seats than they had seen in 40 years, topping the record 16 seats won by Mr. Trudeau’s father in 1968. Here are a few of the Twitter well-wishes Mr. Trudeau has received from world leaders and celebrities. .Congrats to Team @JustinTrudeau on a spectacular victory! I'm hopeful tonight's election will put Canada back in a leadership position heading into #COP21. Congratulations to @JustinTrudeau. Felicidades a @JustinTrudeau por su victoria electoral. Canadá y México tienen la oportunidad de iniciar una nueva etapa en su relación. Congratulations @JustinTrudeau for victory in Canadian parliamentary elections! Congrats to new Canadian Prime Minister @JustinTrudeau. I look forward to the strengthening of our bilateral relationship. Congratulations Canada ! And thanks for giving me a whiff of hope for the future. Canada’s election upset was a top story at news organizations around the world, including Britain and the United States. Kremlin-controlled media in Russia – whose President Vladimir Putin was a frequent foe of the Harper government over the conflict in Ukraine – was gleeful at Mr. Harper’s defeat. Reaction has been muted so far; the Canadian dollar dipped slightly on Tuesday morning. But considering that Mr. Trudeau campaigned openly on a policy of running deficits to spend on infrastructure and other programs, analysts will want to know more about how the economy will change under his leadership. If you’ve lost track of the campaign, we don’t blame you: It was 11 weeks long (78 days, to be precise), the longest in modern Canadian history. Here’s Eric Andrew-Gee and Paul Fairie’s take on 14 of the major highlights and how the horse race unfolded. The Globe’s Tamsin McMahon and Julia Wolfe sifted through a decade’s worth of data to see how much donation money the major federal parties have received and where those donations come from. The parties have depended on Ontario for nearly half of their campaign money, though an increasing share came from Western Canada. Meanwhile, contributions from Quebec have declined dramatically. Those donations may have played a decisive role in this election, the first in more than a decade where the national parties couldn’t rely on taxpayer per-vote subsidies to pay for their campaigns.